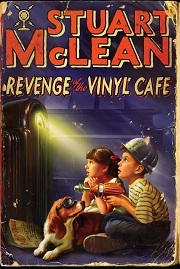 You know, I wasn't going to blog about the recent two-night stint Stuart McLean and The Vinyl Cafe spent in our community. After all it happened last week already, and this seems like old news. I decided, however, to blog about it for two reasons. First, there are no rules to blogging, which is really the joy of the whole exercise. One can blog about what they want when they want and then just throw it out there, to be read or unread. The second reason is that some moments of the evening I spent with Stuart have stayed with me, and I feel the need to share them. And so this blog post is written, because really blogging is all about making your own rules and sharing whatever you think you need to share. When I first heard Stuart McLean was coming to town I snatched up tickets as soon as they went on sale. You see I've been listening to him on CBC Radio for many years, his tales of Morley and Dave, their children and their friends, their neighbours and their adventures in life. Stuart is a masterful storyteller, perhaps the very best in the business, and I have spent many hours in rapt attention as his voice poured out of a radio or a car stereo or a pair of earphones. Many years ago I introduced the Intrepid Junior Blogger to the joy of The Vinyl Cafe, and have many times been delighted to find her in her room, listening to Stuart on the radio on her own accord, seeking him out as I have sought him out over the years. It has always felt somehow like Morley and Dave and their lives were part of our lives, too. They had become like family, and so too had the storyteller who deftly wove the narrative of their lives. And so I bought three tickets, enough so our entire little family could go, and we found ourselves in Keyano Theatre anxiously awaiting the arrival of Stuart. That morning, while the Junior Blogger was eating her breakfast, I had played one of the Christmas stories from The Vinyl Cafe. It is entitled "Ferrets for Christmas", and since the Junior Blogger owns and adores three little ferrets of her own (variously known as "the weasels", "the wuffles", and "the woozles") I knew she would love the story of another Sam, this one a little boy, bringing home the class ferret over the Christmas holidays. She was enchanted with the story, and while her usual morning routine includes some time on the X-Box before school she happily spent that time listening to a tale about Christmas and family and ferrets instead. That night when Stuart took the stage I think we all were a bit awestruck. None of us had ever seen him live, but as soon as he began to speak and that distinctive and melodious voice poured into the theatre we felt right at home. It was the same voice that had spoken to us almost every Sunday for years, a voice that had accompanied us on long car trips through the Canadian wilderness as we drove home from places like Edmonton and Saskatoon and Kenora and Dryden. It was the voice that had kept me company as I baked cookies and did crafts and, a very long time ago it seems, rocked a small baby to sleep. Hearing that voice was like magic, but there was only one problem for me. I couldn't look at Stuart. You see I think for so long it has been just a voice, and I found watching Stuart, his hands flapping as he gesticulated points, his body in motion, too distracting. It threw me completely, and I felt quite off, like something wasn't quite right. And so I sank back into my chair at the theatre, closed my eyes - and there it was. Magic. As soon as I closed my eyes and just let his voice wash over me I felt renewed. I listened as Stuart recounted three new Dave and Morley stories, taking us to a backyard waterpark, a yoga retreat, and a garden in the autumn. As he went on and the stories were told I found myself opening my eyes, having needed to only close them for a brief time to centre myself, and to centre that iconic voice. When I opened my eyes I no longer found Stuart's actual presence distracting, and instead I welcomed the nuances his live performance added to the stories I have come to love. The Vinyl Cafe always has a musical guest, and so too it was here in Fort Mac when musician Harry Manx joined Stuart's regular musicians to play a few numbers. Harry is a talent indeed, someone who explores music the way a writer explores words, and the creativity he embodies is one I respect to my core. At one point Stuart took questions from the audience, and someone asked him about writing. When he explained his process - how long it seems to take going from first pot of coffee to first actual word written, I laughed, and even more so when the Junior Blogger whispered "That sounds just like how YOU work!" as indeed it is. It is so fascinating to hear how he writes, and where, because I am always curious about the creative process of others. Later that night I would tweet that if I could write one-tenth as well as Stuart I would feel accomplished, and that is the truth. He is not only a masterful storyteller but a powerful writer, as every story he writes shows - but one in particular that evening caught me. When Stuart told of Morley's garden in the autumn it was so evocative I almost cried. I could feel tears form in the corners of my eyes, as fall is my favourite season, and every fall I feel both happy and melancholy. I always feel that fall is entirely too short a season, over too soon and not giving you enough time to adjust from the bright, warm days of summer to the dark, cold days of winter. And yet I still love autumn, that all-too-brief season of change as the natural world quiets for the winter, and my heart thinks of all the autumns past. That the Intrepid Junior Blogger was born in fall should come as no surprise as in my life it seems all the best things have occurred in that season. And so Stuart spoke of autumn and I was moved to tears. The other stories had made me laugh, but this one made me remember instead, made me recall the autumn my little girl was born, and all the autumns since. It made me wonder about all the autumns to come. With simple words, carefully crafted and delivered in that voice I have come to know so well, Stuart painted a picture right before my eyes, and I sat humbled by both the beauty of the story and his skill in creating it. When I began this post I commented that I had spent the evening with Stuart. And okay, it was me and him and about 400 other people, and yet somehow it felt like it was just me and him chatting over tea as winter began to swirl outside. When Stuart commented that he felt like he was in Fort McMurray's living room that night I had to agree. It did not feel like we were inside a theatre at all. It felt, for all intent and purposes, like we were home. And perhaps that is where the true power of a writer and storyteller like Stuart McLean lies. Perhaps it is his ability to make a theatre feel like home, even when normally you hear his stories in your own home or car. While at the beginning of the evening I could not watch him, had found it too disconcerting, by the end of the evening I felt like I was sitting at home in my favourite chair, radio tuned into The Vinyl Cafe, a mug of coffee beside me, and my eyes closed as I let the stories wash over me and into my heart. I truly hope he comes back to Fort McMurray some day, bringing with him new stories of Dave and Morley and their lives, but until then I will listen to him on the radio, eyes closed, and heart wide open.